PennsylvAsia: "Asia Pop" one-credit mini course at Pitt, Fall 2019. 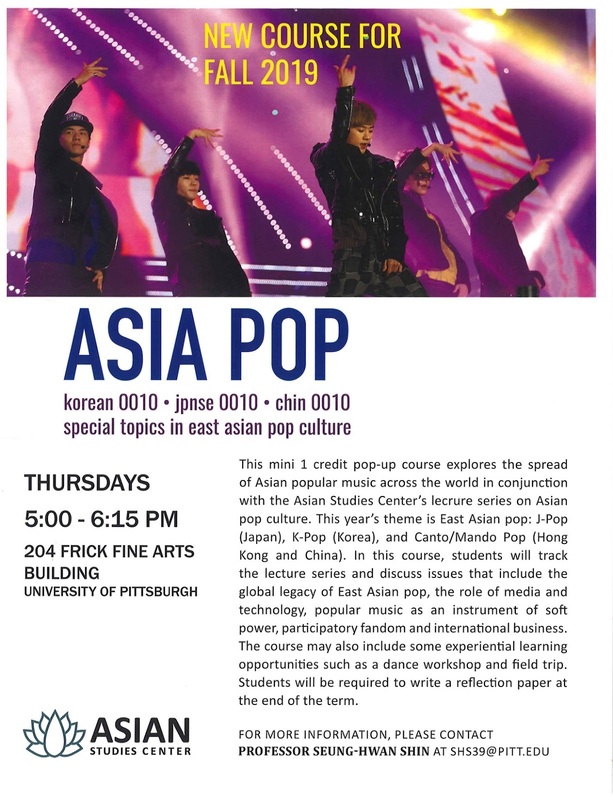 "Asia Pop" one-credit mini course at Pitt, Fall 2019. The University of Pittsburgh's Asian Studies Center will offer a 1-credit mini course titled "Asia Pop" in Fall 2019. This mini 1 credit pop-up course explores the spread of Asian popular music across the world in conjunction with the Asian Studies Center lecture series on Asian pop culture. This year's theme is East Asian pop: J-pop (Japan), K-pop (Korea), and Canto/Mando Pop (Hong Kong and China). In this course, students will track the lecture series and discuss issues that include the global legacy of East Asian pop, the role of media and technology, popular music as an instrument of soft power, participatory fandom and international business. This course may also include some experiential learning opportunities such as a dance workshop and field trip. Students will be required to write a reflection paper at the end of the term.